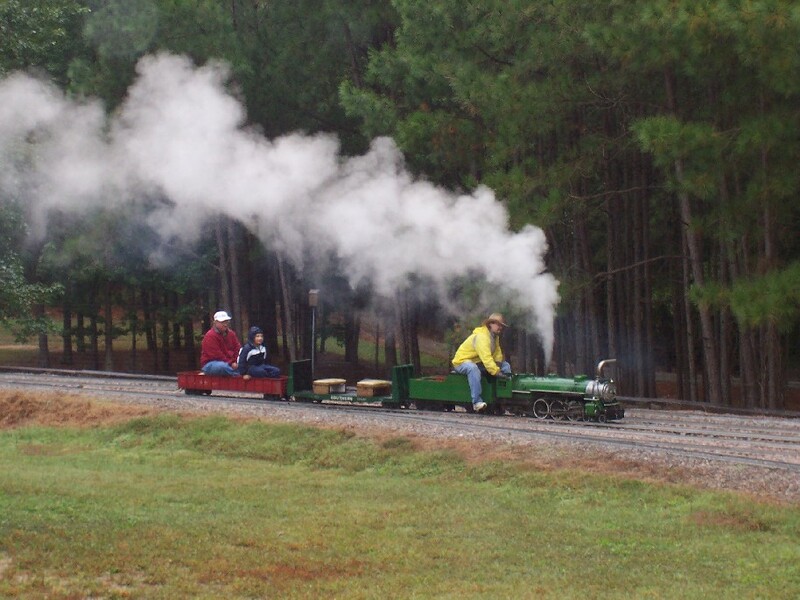 This weekend October 5 - 7, 2007 is the North Carolina Live Steam Meet in Apex, North Carolina. This event has been hosted for years by Tony (last name escapes me, but I will find out Saturday) and has about 40+ acres of farm land that has about 2 1/2 miles of 7 1/2" rail throughout. They feature many coal fired steam locomotives in addition to some propane and gasoline powered locomotives as well. The photo to the left is from last year's event, that is a Southern coal fired locomotive making it way back to the staging area. My good friend Bob Dukert from Michigan introduced me to this event, we finally meet for the first time at last year's fall event. Bob has been a member of the group and attending these events since 1991. They have two steam meets, one in the spring the first full weekend of May, and one in the fall the first full weekend of October. The event used to be open to the public, but have closed it because of problems with parents dropping kids off and coming back to get them, as well as liability in case of accidents. Monique, Ben and I will be attending again this year, Ben did not make it last year as he was spending the day at his friends house. This Saturday I am making a batch of Cajun Chicken and Sausage Jambalaya and bringing it for all to enjoy.